In 1984 and 1985, limited excavations were carried out in the north-east corner of the bailey, before and after emergency works to stabilize a leaning portion of curtain wall. The excavations, though small in scale, produced clear evidence .for a primary occupation in the 12th century, and for a substantial masonry-building phase in the 14th and 15th centuries, thus going some way to confirming the evidence, from architectural and documentary sources. The excavations were funded by Historic Scotland. 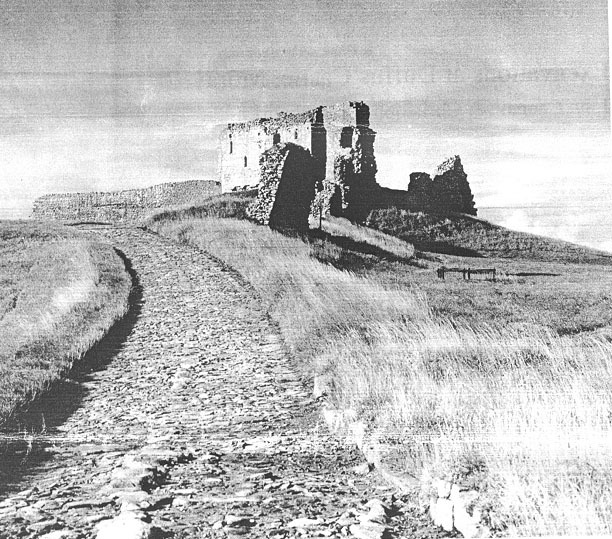 Duffus Castle passed into State care in 1926 and immediately thereafter major consolidation works were carried out on the upstanding masonry, including the stretches of curtain Wall encircling the bailey. 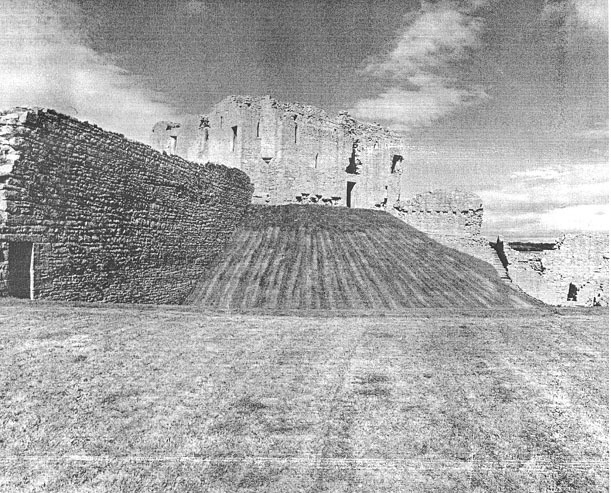 Towards the end of 1983, a large crack in the ground was observed immediately uphill (that is, south) of the stretch of leaning curtain wall in the north-east corner of the bailey (illus 1) Imminent collapse of the wall was feared and a decision was made by the then Scottish Development Department (Ancient Monuments), now Historic Scotland, to bring the wall back to the vertical position. Temporary scaffolding was erected in December i983 to shore up the leaning wall and a small excavation was carried out in January 1984 on the uphill side of the wall (Trench F) in the hope of locating the original position of the wall and thus enabling its accurate reinstatement. 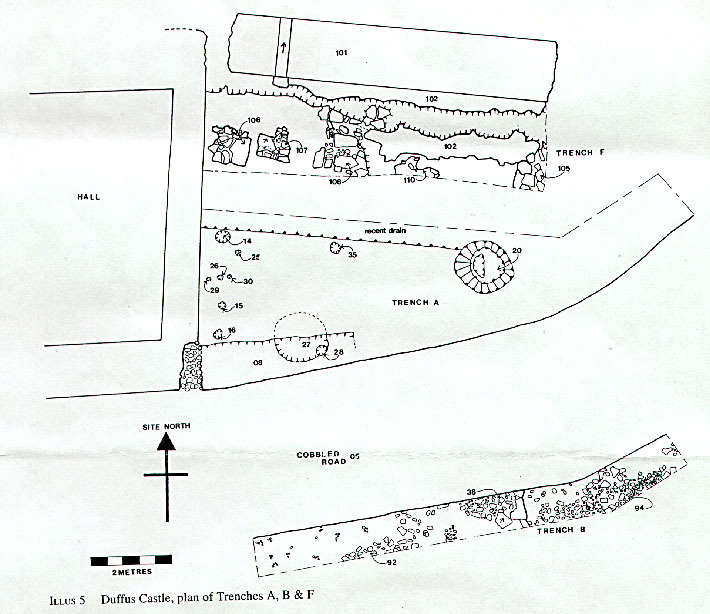 In October 1985 a further small-scale excavation was carried out with two aims: (a) to establish more clearly the function of the room of which the 'leaning' wall formed the north side (Trench A); and (b) to determine more precisely the alignment and nature of the missing curtain wall at the northeast corner of the bailey (Trenches B-E). led road, the bridge, and the outer moat date probably no earlier than the 16th century. its abandonment, probably by the death of the 2nd Lord Duffus in 1705, the castle was little more than a decaying fragment, completely unsuited as a residence of nobility (MacGibbon 8,: Ross 1887, 278 80; Cruden 1981, 125-6). Lulach Macgillecomgan, who had stepped into the shoes of the murdered Macbeth as King of Scots in 1057. Fiercely independent and deeply suspicious of the growth of the national monarchy, Angus rose up in revolt in 1130. The rising was firmly put down by David I, the Earl was deposed and his Earldom taken into royal hands. King David immediately began to settle the province with men of his own choosing, landlords whom he could trust to preserve 'the King's peace'. Perhaps the most important newcomer was Freskin, a Flemish soldier of fortune already in possession of an extensive estate in Lothian (Strathbrock, now Uphall). He was encouraged to come north and settle in the lands of Duffus (Barrow 1973, 282). His son, William, adopted the title 'de Moravia' ('of Moray'), and by 1200 Freskin's descendants had become the most influential family in northern Scotland, with kinsmen settled throughout Strathspey and across the Moray Firth (Balfour Paul 1911, iii, 318-23). It was most probably Freskin who built the great earthwork-and-timber castle, a motte-and-bailey, which so impresses visitors today. The motte is a massive mound, entirely man-made, with steep sides and a wide, deep ditch encircling the base. Upon its flat top would have stood timber buildings, further protected by a wooden palisade drawn around the edge of the summit. The motte was reached from the bailey, a broad expanse of ground raised above the surrounding land though not as high as the motte, either by a bridge carried over the ditch or by steps climbing the mound. Here were the ancillary halls, lodgings and service offices, such as the brewhouse, bakehouse, stables, workshops, and perhaps a chapel, all necessary to maintain the household. Sadly, none of these structures has survived. About 1270 the direct line of Freskin ended in two heiresses, One of whom married Sir Reginald Cheyne the younger. For a time the Cheynes became the castle's new owners. But by about 1350 the last Cheyne, Lord of Duffus, had died, leaving the estate to another heiress who married Nicholas, second son of the 4th Earl of Sutherland. The Sutherlands remained in possession until 1705 (Balfour Paul 1906, iii, 191). We cannot say with confidence who gave the instruction to rebuild the old timber castle in stone in the 14th century. Neither the architectural detail nor the documentary record is sufficiently explicit for us to be sure. A reference from the year 1305 recording a grant to Reginald Cheyne of 200 oaks from the royal forests of Darnaway and Longmorn 'to build his manor of Dufhous' (Bain 1888, 375 and quoted in Cruden 1981, 126) indicates a major rebuilding programme underway at that time and it may be that the wood was needed for flooring and other parts of the emerging stone castle. We know that Cheyne's estate had suffered quite considerable damage during the Wars of Independence with England, then at its height, and it is possible that Reginald Cheyne was putting to rights war damage and taking the opportunity thus presented of building a more impregnable castle of stone. In :he new castle the motte continued to support the main residence, a two-story rectangular tower presumably with an embattled parapet at the wall top. The lord's hail was on the first floor, with a latrine and small chambers, possibly used as bed-closets, off it. The ground floor may have been used for storage as well as accommodation for the lord's household. The tower was designed with defence firmly in mind. The windows are small and sparsely set. The one entrance into the ground floor has been protected by a portcullis. Doors at either end of this front wall gave access from the first floor directly onto the wall-walk of the curtain wall. That curtain wall, punctured by four gateways (three of which survive), completely enclosed the bailey. There may have been quite a cluster of buildings within it, as the numerous put-log holes in the curtain wall show. All have now gone. Along the north side, however, are the vestiges of a stone range that, in its day, was impressive. It began life as an outer or great hall, a reception room less restricted than that in the main tower, with a kitchen at one end (confirmed by excavation) and a more intimate withdrawing room, the great chamber, at the other. This building may have been erected after the Sutherlands became lords of Duffus. The injudicious building of a stone castle upon the old earthworks is self-evident. Quite when the walls started failing is uncertain, but repairs were carried out on certain subsidence fractures before a greater part of the tower slid down the slope. The tower itself shows no sign of later modification and may have been abandoned quite early on. The stone hall block in the bailey appears then to have become the main residence, with alterations and additions carried out to convert it into a modestly impressive laird's house. The ditch encircling the motte was abandoned at the same time. are known to have included an impressive orchard in the area between the motte-and-bailey earthworks and the outer moat (OSA 1793, 395). It was probably in the remodelled hall block, not in the main tower, that Claverhouse dined as a guest of Lord Duffus during his lightning campaign that ended at Ki!liecrankie in 1689. An elderly woman, alive in 1760, recalled working at the castle as a girl and remembered bringing the claret to the table during that dinner, probably one of the last occasions the old castle was used (Shaw & Gordon 1882, 83-4). When the 2nd Lord Duffus built a new residence, Duffus House, a short distance away, in about 1700, the castle fell rapidly into decay. The excavations (illus 4 & 5) were small in scale and little sense could be made of most of the features found. Interpretation was further hampered by two other factors: first, the extent of the ground disturbance carried out by the Office of Works in the late 1920s as part of its operations to stabilize the upstanding masonry (most noticeable in Trench E) and, secondly, by the limitations imposed by the scaffolding and safety considerations in the vicinity of the 'leaning' wall in Trench F. Nevertheless the excavations produced evidence for three broad phases of activity and this report deals with each phase separately in chronological order. This first phase, examined only in Trenches A and C, was clearly distinguished from later phases by being sealed beneath a thick deposit of firm, mottled yellow/green clay. The phase was dated to the later 12th/early 13th century by shards of straight-sided cooking pots (illus 6, nos 3, 5 & 6). Phase 1 deposits survived patchily over much of Trench A, though it was possible to have only a brief look at the full sequence of pre-14th-century activity in a small sondage in the southwest corner of that trench. In the sondage, pinkish clay, presumably natural, was reached c 1 m below the present ground surface. Directly above this natural clay was a layer of silty loam containing a few small pebbles and flecks of charcoal. This had all the appearance of a buried topsoil above the freshly scarped surface of the bailey. Above this was a 100 mm thick mottled yellow/green clay which seemed to be a deliberate dump, and from which an almost complete, but rather squashed, bovine skull was recovered. Overlying the clay was an isolated lump of silty loam reaching a maximum thickness of 400 mm. Outwith the sondage, and stratigraphically contemporary with the loam, was a thin, intermittent layer of silt with signs of burning on its surface. The only features of note were three patches of metalled surface at the east end of the trench. The sequence of deposits in Trench C was broadly comparable with that in Trench A. Apart from the fact that the depth of the phase 1 deposits suggests a considerable period of occupation, nothing more can be inferred. This phase comprised deposits lying above the clay sealing layer referred to above. This clay layer, recorded in Trenches A, C, D and F only, is interpreted as a preparation layer laid down immediately prior to the building of the stone castle. The architectural and documentary evidence suggests that this was some time in the first half of the 14th century. The phase 2 deposits covered the broad time-scale of the 14th-16th century, based on the pottery evidence, and were not capable of being refined further. Prior to excavation, the existence of a slop-drain in the 'leaning' curtain wail suggested the possibility that this area to the east of the great hall had been a service office, most probably a kitchen. Excavation supported this observation. The 'leaning' wall and the wall to its west appeared to form the north and west walls of the kitchen. Excavation confirmed that the west wall, despite being largely rebuilt by the Office of Works in the 1920s, was genuine. A number of post-holes (14, 15, 16, 28 & 35) and stake-holes (25, 26, 29 & 30) within the kitchen may have held scaffolding poles used in the construction work. The west wall had been built directly on top of the clay dump without any footings, though where it returned west to form the south wall of the great hall it had a shallow foundation of mortared rubble. This same rubble foundation protruded 100 mm beyond the east face of the wall. Continuing east of this foundation and overlying one of the post-holes (28) was a shallow slot (08) filled with small stones and sand. This was almost certainly the foundation for the south wall of an extension east of the great hall. Although this extension was built later than the great hall, because the foundation slot (08) overlay both the post-hole (28) and the mortared foundation (06), it was undoubtedly planned at the same time. The location of the east wall of the kitchen was less apparent. Excavation produced three possible candidates in Trench F. The first was a mass of rounded boulders (105) with just a hint of a north/south face along its west edge. The second was a mortared stone feature (110). The third was the remnant of a light north/south wall (108) consisting of two stones dressed on their west faces and surrounded by loose rubble. The movement of the curtain wall had destroyed the north part of this feature, and a later cut had removed its east face, making its width indeterminable. Wall 108 seems the most probable of the three, for if its line is extrapolated south it would meet up with the east end of foundation 08. This would give a kitchen measuring 6.5 m north/south by 3 m east/west. The interior of the kitchen produced evidence for dense burning in the north half but none in the south half, suggesting that the fireplace had been set against the curtain wall. This would place the slop-drain in the back of the fireplace, a common enough location. Though the north half was not excavated to any extent (the top surface was briefly cleaned and recorded), two stone settings (106 and 107) were noted. Excavation to the east of the kitchen produced nothing further regarding built structures east of the kitchen or indeed of the curtain wall itself. Instead it produced clear evidence for demolition and clearance at a later medieval period. Almost all the clay sealing layer had been removed by a large north/south cut. The cut formed an almost vertical edge 350 mm deep. The reason for a major scarping can only be guessed at but it must post-date the disuse of the kitchen. There were other features in the stony, silty loams that overlay the cut, including a steep-sided circular pit (20), 1 m deep, whose function is unknown. A shard of late medieval pottery came from its topmost fill. This small trench revealed a patchy cobbled surface 500 mm below the present ground surface. The cobbles were divided into three discrete patches: (a) a mixture of rounded stones (92) rather loosely laid; (b) larger and more closely-laid cobbles (38) with a kerb of sandstone slabs on the east; (c) a spread of rounded cobbles (94) loosely bedded and very uneven. None of the cobble spreads was particularly worn. One of them, (38) was noticeably better laid and it is possible that it represents a trackway pre-dating the 18th-century one (see below). There was no sign of the east curtain wall in the trench. Other than the clay sealing layer (52) mentioned above, little of any substance was noted. However, several shards of pottery, including two with pie-crust decorated rims, recovered from the layers directly above the clay sealing layer 52 may be dated to the early 14th century (illus 6, nos. 1, 2 & 4). The opening of this trench was prompted by the presence of three large squared boulders (46) protruding above the turf. They lay approximately along the line of the projected east curtain wall and it was hoped that they might produce further evidence for the 'missing' curtain wall along this north-east side of the bailey. The stones lay directly on top of the clay sealing layer (called 47 in this trench but identical to 36, 52 and 103 in Trenches A, C and F respectively). They certainly appeared to be foundation stones, but for a wall no more than 0.6 m wide, clearly insufficient for the substantial width of a defensive curtain wall. (The 'leaning' wall in Trench F was 1.45 m wide and its foundations had cut through the clay sealing layer 103, not laid on top.) These stones are more likely to have formed part of a building enclosing the adjacent oven structure which was consolidated and laid out in the 1920s. The phase 1 layers beneath the clay seal were not excavated. This small trench confirmed the extensive underpinning of the upstanding stretch of the east curtain wall carried out by the Office of Works in the 1920's. It also revealed a large stone-lined pit adjoining the north-west corner of the wall. The precise shape of the pit could not be ascertained but it probably measured c I m in diameter at the top, narrowing to 0.7 m near the base. It was c 1.6 m deep. The pit had been completely cleared out in the 1920s and no datable artifacts were recovered. The relationship between the pit and the wall had been destroyed in the 1920s but the pit did not appear to post-date the wall and the balance of opinion points to the pit and curtain wall being contemporary. The evidence for extensive demolition and clearance at the north-east corner of the bailey has been noted above. Though not precise, a date late in the medieval period is suggested by the pottery. By contrast, the present cobbled road that enters the bailey at the north-east corner was closely dated by pottery. A basal shard, unbraided and unworn, from a Delftware plate, made c 1750, Was recovered from the bedding sand, indicating that the road was built in the third quarter of the 18th century. 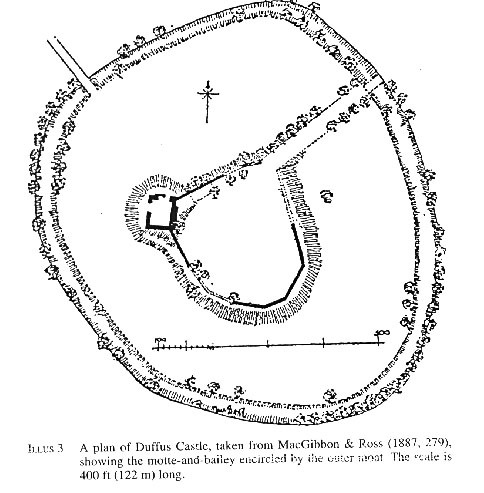 The excavations produced clear evidence for primary activity at the site in the later 12th century, thus confirming the documented evidence linking the origin of the castle with the arrival of Freskin of Strathbrock about AD 1150. The limited nature of the excavation precluded any clearer picture emerging of the nature and appearance of that first earthwork-and-timber castle. The excavations also produced evidence for a radical rebuilding of the castle in stone at some stage in the 14th century. The earlier buildings in the bailey seem to have been removed wholesale and the ground leveled by the dumping of a thick clay sealing layer. Thereafter the masonry walls of the new castle were erected. The encircling curtain wall was founded by cutting through the clay, but the other less substantial walls were laid directly on top of the clay. The excavations have suggested that there was a kitchen, immediately to the east of the great hall, measuring about 6.5 m by 3 m. No other structures were identified. 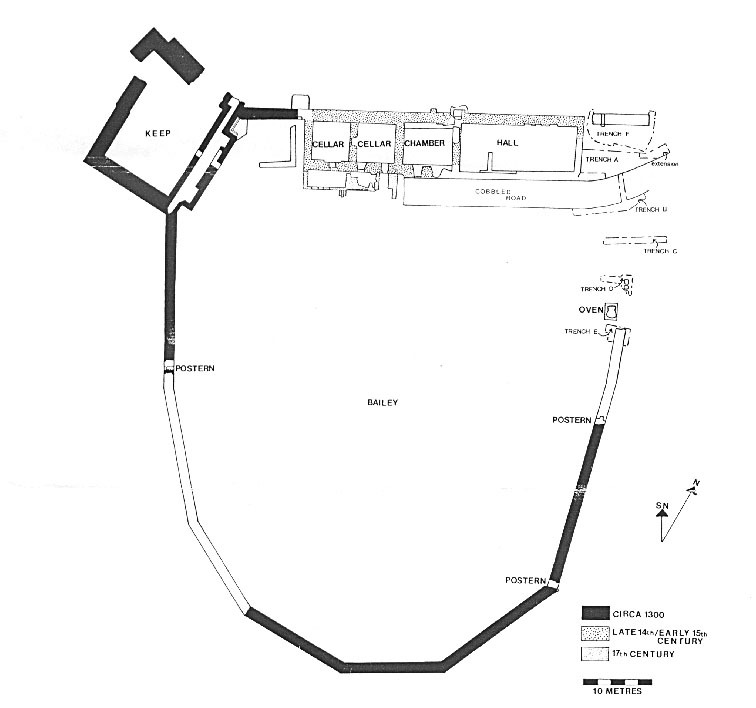 At some later stage major demolition and clearance works were undertaken in the north-east corner of the bailey; so comprehensive were these that all trace of other structures, and most critically the encircling curtain wall at this point, had been removed. The nature of the gatehouse, which is likely to have been situated at this point, will never be known. Although these clearance works cannot be closely dated, it seems reasonable to link them with major changes to the main residential accommodation referred to above. The creation of a modest house (out of the shell of the great hall and chamber along the north side of the bailey) to replace the accommodation lost with the collapse of the tower atop the motte, might explain the abandonment of the kitchen. The apparent clearance of the north-east curtain wall in the later medieval period is not so easily explained. beautiful objects which the country exhibits. This report was written in draft by John Cannel and edited by Christopher Tabraham, who organized the excavations on behalf of the Inspectorate of Ancient Monuments (SDD) and who added the section on the history and architecture and the conclusions. Both are indebted to Eoin Cox, John Lewis and Alan Radley, who assisted at the excavations, and to George Haggarty who advised on the pottery. Alan Radley also assisted in the preparation of this report and of the archive, which has been lodged with the National Monuments Record of Scotland. The pottery has been deposited in the National Museums of Scotland. The excavations were funded entirely by the Scottish Development Department (Ancient Monuments), now Historic Scotland. Bain, J (ed) 1888 Calendar of Documents relating to Scotland, Vol IV. Edinburgh. Balfour Paul, J 1906 8,: 1911 The Scots Peerage. Edinburgh. Barrow, GWS 1973 The Kingdom of the Scots. Edinburgh. Cruden, S 1981 The Scottish Castle. Edinburgh. MacGibbon, D & Ross, T 1887 The Castellated and Domestic Architecture of Scotland, Vol 1. Edinburgh. OSA 1793 The Statistical Account of Scotland. Edinburgh. Shaw, L & Gordon, J 1882 The History of the Province of Moray, vol 2. Edinburgh.